Whether your company’s needs involve investment management of corporate assets or establishing and monitoring a corporate retirement plan, COMPASS Wealth Management, LLC has the industry expertise to meet your need. 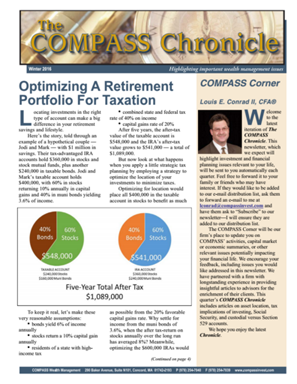 The background of COMPASS’ president, Louis E. Conrad II, CFA®, includes managing an equity mutual fund, as well as institutional portfolios, including endowments, pension plans, and a variable annuity subaccount. Let us put our expertise to work for your institutional portfolio, whether you represent a company, endowment, or non-profit. As a plan sponsor, you offer a retirement plan to your employees as a benefit of their employment. A wide range of choices are available in the retirement plan marketplace. Should you have a bundled or unbundled plan? What is the most cost-effective choice? Is anyone standing beside your investment committee as a co-fiduciary? Who is monitoring your investment managers and documenting their compliance with your investment policy statement? How thorough is the analysis of prospective managers? Do your employees fully understand this benefit? Our Fiduciary Advisory Service is designed to meet the varied needs of plan sponsors. The basic tenets of our approach are that we act as a co-fiduciary and provide objective and independent investment consulting services. We assist you whether you favor a bundled or unbundled approach. In consultation with you, we determine what makes the most sense for your organization and provide you with the information you need to make a knowledgeable decision. We oversee 401(k), 403(b), and 457 plans, as well as defined benefit plans, profit sharing and money purchase plans, SIMPLE and SEP-IRAs, non-qualified deferred compensation plans, and employee stock ownership plans.